Professional and portable, Dahle's mechanical pencil sharpener accepts standard, oversized, and European made pencils up to 12 mm in diameter. It features point adjustment to create blunt or extra sharp tips, as well as automatic feed and shut-off when the desired point is reached. Dahle sharpeners have Solingen steel blades that remove easily for cleaning. They are safe for even the softest leads and pastel pencils. 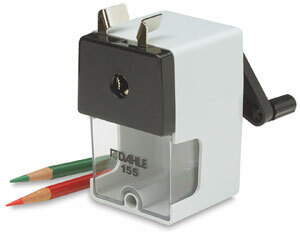 To many professional artists and illustrators, Dahle's shut-off and point adjustment mechanisms make their sharpeners the most economical choice, as well as the most convenient.